Enjoy a day’s shopping without worrying about being loaded down with heavy or awkward presents. Enjoy a great day out with all the family and get into the Christmas Spirit from the start by whisking them away in a luxury helicopter. Start the day by making travelling there part of the adventure of this special day; something to be cherished forever. Christmas is coming so prepare for this enchanting time by visiting one of the largest ‘authentic’ German Style Christmas markets in England. 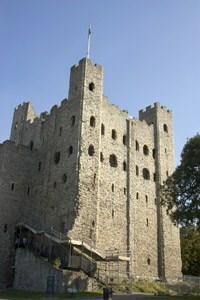 Relax with a bespoke flight from the site of your choice direct to Rochester. 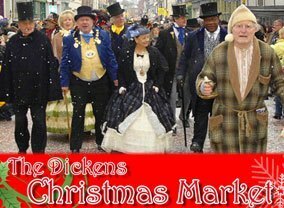 Upon landing you will have a luxury vehicle to transport you directly to the Dickens Christmas Market, only ten minutes away. A truly enjoyable experience shopping at the Dickens Christmas Market is even better when you are not loaded down with heavy or awkward presents. Using Atlas Helicopters’ service means that all the details are taken care of for you, including the care of your packages. Be transported in a chauffeur driven car to the Dickens Christmas Market. The car will remain with you during the day so you can easily offload the presents to continue to enjoy your shopping experience. The Dickens Christmas Market features traditionally inspired German-style Christmas chalets, a giant Christmas tree and a carousel for children of all ages! The Dickens Christmas Market sells a large range of Christmas gifts, hand crafted goods as well as festive fayre. Children will be able to visit Mr and Mrs Claus. However, owing to their popularity appointments will need to be made, as it will be impossible, even with Santa Claus’ magical powers, to see everyone that visits the Dickens Christmas Market. Foodies will enjoy the Dickens Christmas Market too as the event includes a Festive Food Fayre. The smell of roasted chestnuts and glühwein filling the air will warm the hearts of Scrooge himself making the wonderful atmosphere feel even more special. The historic setting adds to the beauty and magical feel of the day. Rochester Castle’s walls will be illuminated, with the entire market decorated in festive tradition, giving visitors an enchanted Christmas experience. Overlooking the River Medway and just a few steps from Rochester’s picture-postcard Victorian High Street, this is the perfect setting for a Christmas Market to be remembered fondly for years to come. The festive atmosphere continues until the 18th December 2013. Thousands of twinkling fairy lights will illuminate the arches over the pedestrian walkways and the 25ft Christmas tree will be illuminated with its own lights, with the market open Wednesdays to Sundays. Visitors will be entertained with street entertainment and Dickensian characters mingling with you. On arrival you will be greeted by the sound of Christmas carols at the Dickens Christmas Market. Fly home happy and content and possibly a little tired, but as you do not have to drive this is the perfect end to a truly special day. To reserve your helicopter flight to the Dickens Christmas Market please call our team on 01256 635000. Tickets to see Father Christmas are limited by time slots so please book as early as possible to reserve your preferred date.